Flying Antique Airplanes: Flooding at Creve Coeur! 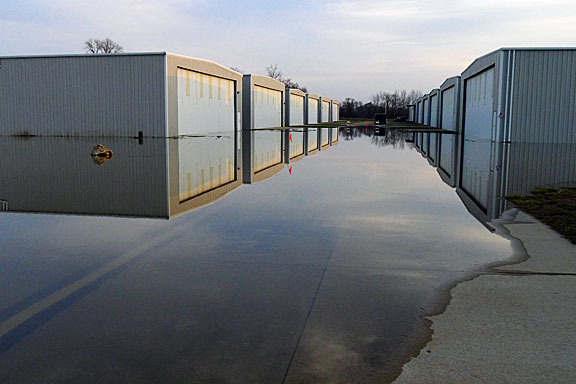 St Louis received about 10 inches of rain over a very short time span is week, causing Creve Coeur Lake to flood.The Missouri River, on the west side of the airport, is still within its banks. The Corps of Engineers built a 500-year dike and a major road on top of the dike. We're all hoping that dike holds. I went out yesterday afternoon after work to get some Cub parts out of one hangar and to move the Fairchild to higher ground. Both aircraft are currently dry. I took some pictures of the flooding on the East side of the airport. 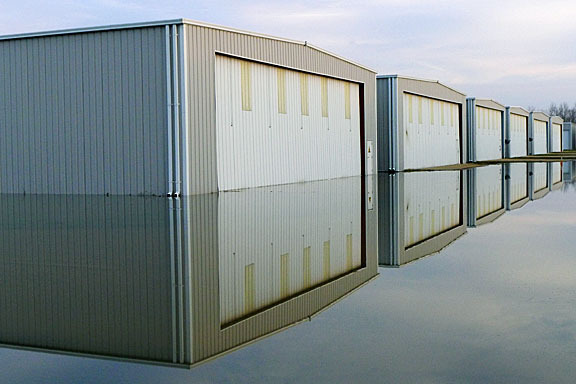 The flood water was dead still, reflecting the hangars. Jacob Layne measures the depth of the flooding. How highs the water Papa?